We have all been there before, the salad comes out and there are a few ingredients you wish weren’t included. You don’t want to be rude, so you eat your way around them. While up at my boyfriend’s parents’ place this weekend, the “salad toppings” discussion sounded like the line at a salad bar–we all wanted different combinations of toppings. My boyfriend’s mother, “the queen of preparation,” pulled the plug on our custom orders and made it easy for everyone by creating a build-your-own salad bar. The concept of a salad bar is nothing new, but doing one at home is such a great way to make sure everyone gets something they like. On a side table, the lettuce was prepped in a large bowl with the basic tomatoes and cucumbers that everyone liked. 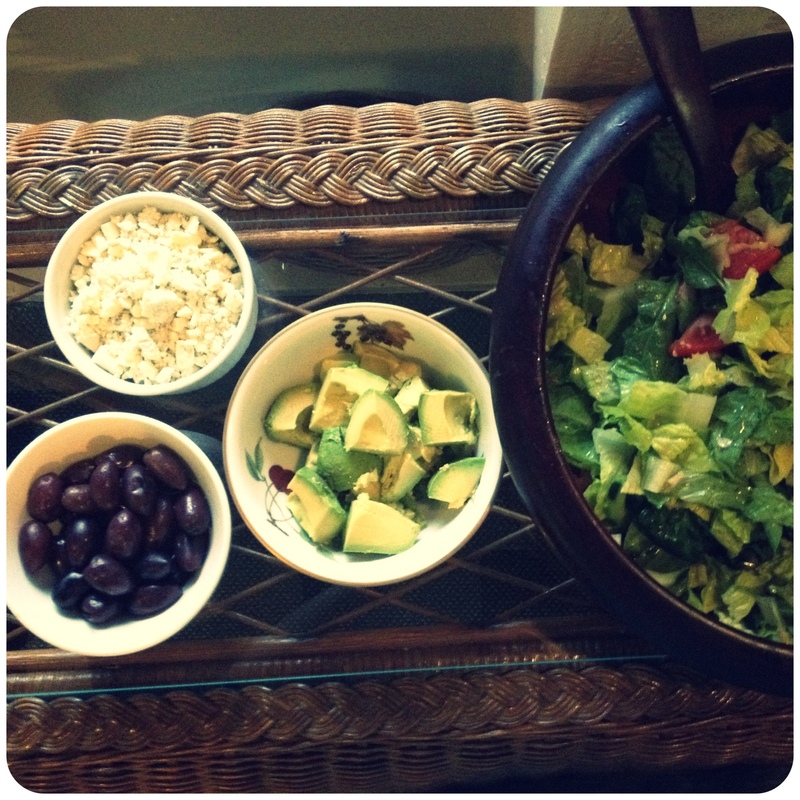 Then, in small bowls, we included the toppings–avocados, olives, and gorgonzola cheese. By not dressing the salad and including it on the side, guests can add any amount they prefer (perfect to allow guests to dress it light). This also allows you to re-use the undressed lettuce later in the week.